Helsinki City Running Day combines the most important running events of Finland into one day: Saturday May 18th 2019. The routes and schedules of the six events have been planned carefully and are now final. The one and only Garmin Helsinki City Marathon takes place for the 39th time – second time in the spring under Helsinki City Running Day! The route remains the same than 2018 which has been praised of its beauty and central location. The biggest half marathon in Finland, Helsinki City Run half marathon (with over 10 000 runners) renewed route is now flatter and faster! The first starting group starts at 11:30 A.M. Helsinki City Running Day offers also shorter distances; Helsinki City 5 and Helsinki City Marathon Relay on May 18th. Helsinki City 5 is a 5-kilometers long street race going through the center of Helsinki and Helsinki City Marathon Relay is a marathon ran by a 4-person team. Helsinki City Marathon Relay uses the same route than Garmin Helsinki City Marathon. It is also possible to run both Helsinki City Run half marathon and Helsinki City Marathon on same day. The event is called Helsinki City Double. The finish line of all events is at the Telia 5G Arena. All routes are measured by the AIMS approved measurer. The marathon and half marathon races are AIMS member events. In 2019 Helsinki City Marathon, Helsinki City Run half marathon and 5 km race have price money. Marathon route remains the same than 2018. The start takes place at the statue of the legend Paavo Nurmi at 15:00 (3 PM) next to Helsinki City Running Day Expo. The route is beautiful, shows the best sides of the Scandinavian nature and takes the runners into the city of Helsinki. The route has received excellent feedback in previous years. See the Garmin Helsinki City Marathon route map in pdf here or at the bottom of this article. Helsinki City Run Half Marathon (HCR) will have a renewed, flatter and faster route in 2019. It will also show the best parts of Helsinki: the beautiful sea views and Scandinavian nature but also the city center of Helsinki. The first starting corral will start from Paavo Nurmi statue (address: Mäntymäentie) at 11:30 am. There is five starting corrals in every 10 minutes (11:30-12:10 AM). 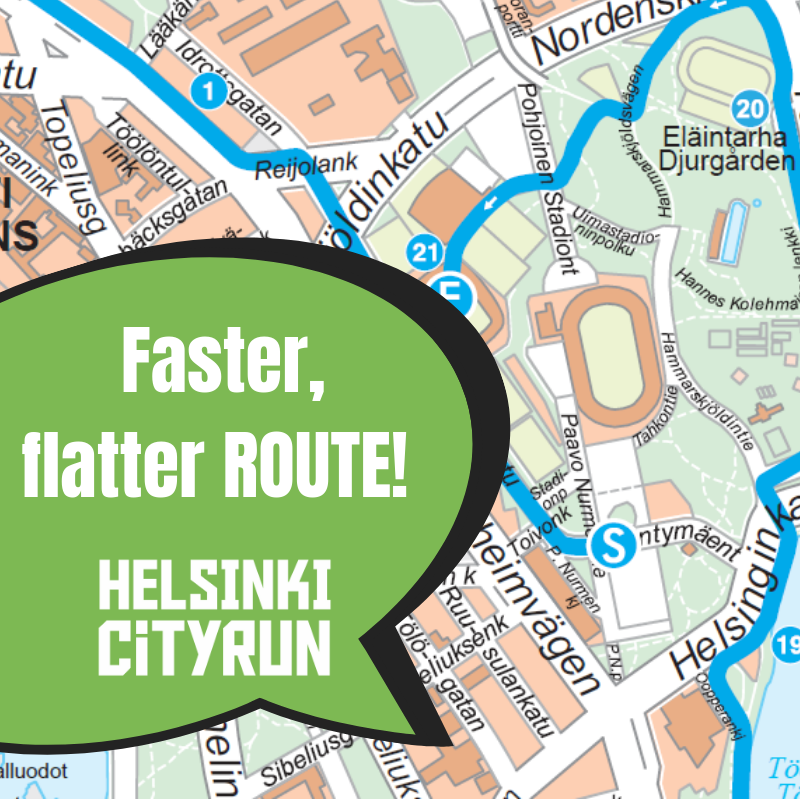 See the Helsinki City Run route map in pdf here or at the end of this article. Helsinki City Marathon Relay is an event connected with the marathon. Marathon Relay uses the same start, route and finish line as well as refreshment stations than Helsinki City Marathon. Relay transition areas are located on the side of the marathon route. Relay legs are between 15 and 7 km and the transition points are published later. Runners move independently to the transition areas with the public transportation. The first runner will start at Paavo Nurmi statue (address: Mäntymäentie) at same time than marathon runners at 15:00 o’clock (3 PM). See the Garmin Helsinki City Marathon route in pdf here or at the end of this article. The urban Helsinki City 5 Street Run route combines the best of the city. The race starts from Ruoholahti part of the city and goes through the city via the Baana. After that runners pop out of Baana at the Modern Art Museum Kiasma and Music Hall and run along the beautiful Töölönlahti Bay. Runners then circle the last stretch and run along the Eläintarha field until the race ends at Telia 5G Arena. See the Helsinki City 5 route in pdf here or at the end of this article. Helsinki City Double is a 63,3 km run where the runners run both Helsinki City Run half marathon and Helsinki City Marathon on May 18th, 2019. Runners can choose in which Helsinki City Run half marathon’s starting corrals they want to start (starting corrals from 11:30 AM-12:10 AM every 10 minutes). The start of the marathon is at 3 PM and the runner must make it to the start on time. It takes about 10 minutes to walk from the finish back to the start area. Childrens’ Norlandia Minimarathon route is kept the same than 2018 starting from the Eläintarha Track and Field -field and finishing at Telia 5G Arena. Minimarathon is an event for children up to 13 years but parents go along for free! The kids start running at 9:00 with the younger children, but they are free to come back to the play area after the run. Competition office and Running Expo are open for the bib pick up and other services on Friday May 17th and Saturday 18th of May. The bibs must be picked up at least 1,5 hours before individual starting times.